Most of the countries that are best prepared for the energy transition are European. Energy is at the heart of modern economic prosperity. Without it our dreams of a cleaner, greener, more efficient world - including self-driving cars, the internet of things and the data centres and artificial intelligence needed to run them - would crunch to a low-tech halt. Secure and reliable supply of fuels and power has always been essential for industry, public services and our domestic needs, but the global energy system is in a state of flux. Environmental concerns and how we will fuel the technologies for the fourth industrial revolution are recurring themes in discussions about how the energy system will evolve. No single government, industry, company or other institution can address the challenges facing the energy sector alone. However, to progress in energy transition, the world requires a collaborative, systematic approach aimed at solving problems and capitalizing on opportunities. That is according to the World Economic Forum’s Fostering Effective Energy Transition report, published with analytical support from McKinsey & Company, which includes the newly developed Energy Transition Index (ETI) that assesses the energy systems of 114 countries. The ETI provides benchmarks across a country’s energy system performance, based on energy security and access, environmental sustainability, and economic development and growth – dubbed the “energy triangle”. Countries are also assessed on their transition readiness, which measures the future preparedness of a country’s energy systems. Of the countries evaluated, 93 have experienced improved performance, the ETI shows, with 45 nations improving their energy systems across all metrics outlined in the energy triangle. According to the report, there are 43 countries that boast well-performing energy systems and high-transition readiness, which indicates their ability to address the energy transition based on current performance. 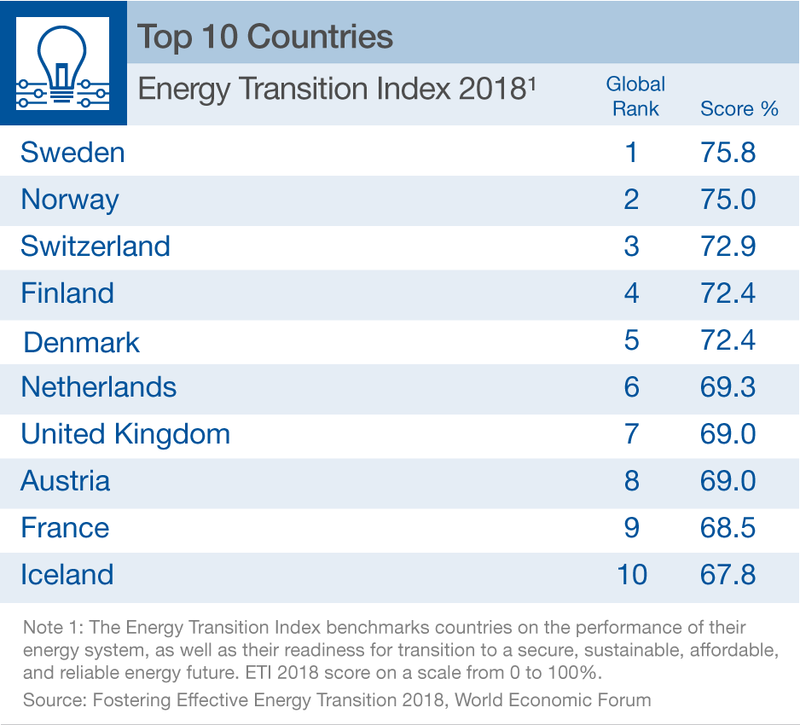 Most of the countries considered best prepared for the energy transition are European, with the likes of Denmark, Sweden and Norway achieving high scores across most metrics. Referred to as “leading countries” in the report, these front runners are typically more advanced in terms of environmental sustainability, with comparatively big improvements in the carbon emissions category. In Norway, for example, carbon emissions are relatively low thanks to almost all electricity being generated from hydropower. Good performance has also been driven by decreasing energy costs for industry and increasing quality of electricity supply, the report shows. What’s more, these countries have also largely overcome the challenges posed by operating a high share of legacy energy infrastructure. “They could serve as examples to other countries when it comes to policy and regulatory frameworks, infrastructure and business environments needed to incentivize consumer and business behaviour change to manage environmental impact,” the report argues. At the opposite end of the scale, the report highlights 14 countries that are facing potential challenges, largely around environmental sustainability. Indeed, the number of countries with decreasing performance scores within this category is 50% higher than for leading countries. According to the report, this indicates the beneficial impact of increased transition readiness. 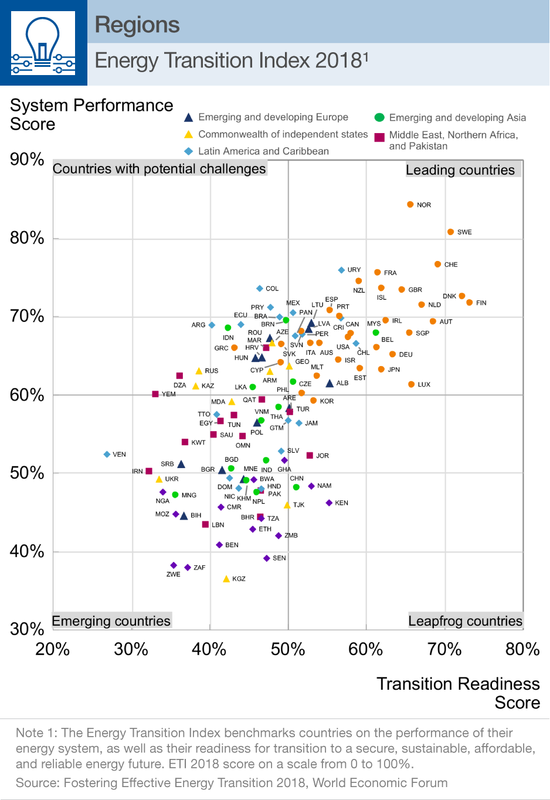 A number of countries, including Venezuela, and Iran, are defined as “emerging”, which indicates improvement opportunities in multiple transition readiness categories. The report argues a reduction of fossil fuel subsidies, improved energy access and quality of supply could allow countries to start improving performance scores in security and access and, to some extent, economic development and growth. 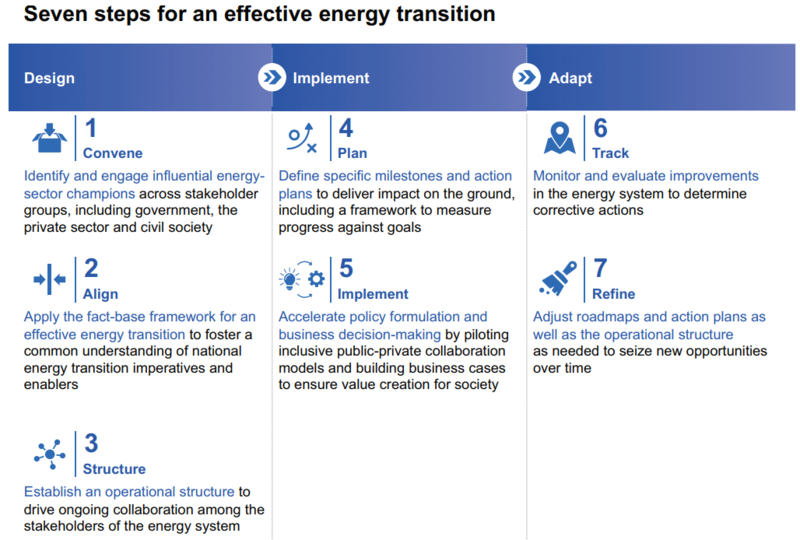 It also outlines seven steps that countries should consider for an effective energy transition, including identifying so-called “energy sector champions”, defining milestones and action plans, and monitoring and refining energy systems over time.